A hybrid contact lens is a combined rigid and soft lens. 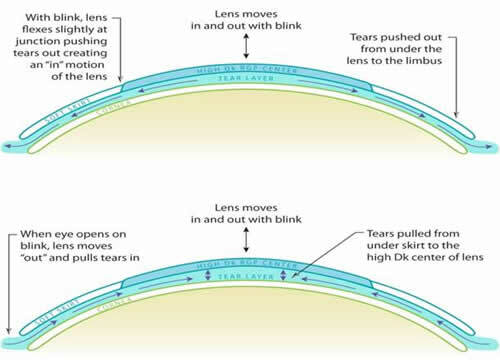 Hybrid lens technology has enabled the binding of a rigid gas permeable (RGP) lens center to a soft lens skirt. This combined single lens system can satisfy the demands for both improved visual quality and wearing comfort. The soft skirt on the lens offers comfort while the rigid center provides clear vision. This design of lens is not available with astigmatic correction however, the GP portion of the lens can mask low to moderate degrees of irregularity and astigmatism. Hybrid contact lenses may further improve vision for patients with keratoconus or corneal ectasia who have subsequently had CXL or CXL combined with Intacs. These lenses are best utilized in patients with mild to moderate states of keratoconus and corneal irregularities. Here at the CLEI Center for Keratocnus, we completed a study to determine the effectiveness of SynergEyes ClearKone hybrid contact lens in improving corrected visual acuity. Thus far, study results are very promising, showing many patients wearing lens with comfort and good vision. Indeed, an overall contact lens fitting success rate of up to 87% has been reported utilizing hybrid lens platforms in our KC patients.